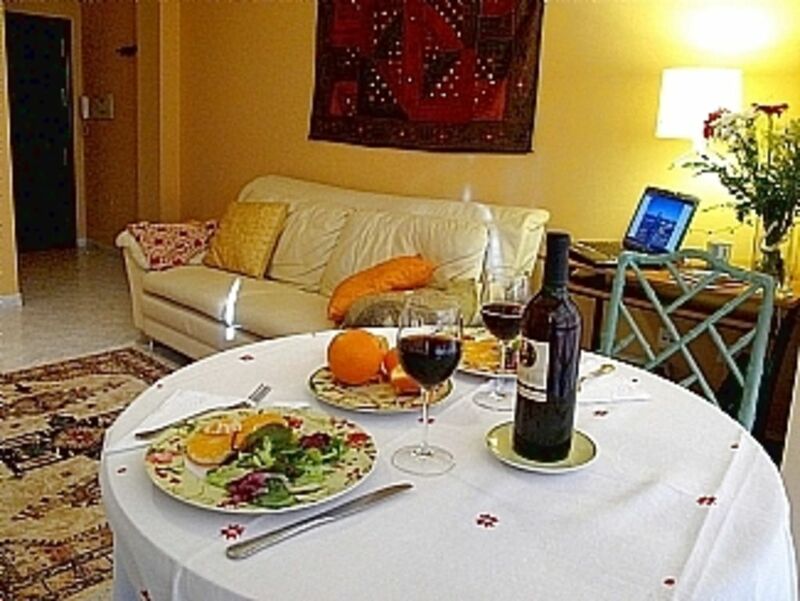 Apartment in Malaga Historic City Center, 10 Minutes Walk To Both The Picasso Museum And The Beach! This bright, charming flat is conveniently located in the historic center of Malaga. The Airport is a short 15 minute drive, or one minute walk to the Airport Train. With in 10 minutes you can stroll down down to the beach and all major historical sites and tourist attractions, including The Picasso Museum. This spacious flat has one large bedroom, one comfortable living room, one bathroom, a great modern kitchen, and a beautiful Andalucian Patio filled with flowers. All of the rooms have exterior windows, which brings in a lot of light. There is also a cot, or folding crib, for babies. The flat is also equipped with a lot of tourist information; maps and tourist guides, and many books for reading and toys for children. 1 bathroom with bath/shower over, wc, bidet and exterior window. Large, bright living room with 13 foot ceiling and large glass door to antique balcony. One leather sofa, two folding bed, television, DVD, and stereo. Modern kitchen equipped with large refrigerator and freezer, oven, cooker or stove top, oven, microwave, washing machine, coffee maker, and kettle and full set of pots, pans, cooking utensils, plates, etc. Sierra Nevada is 1.30 hours by car and 2.30 hours by bus. There are more than 10 golf courses less than 20 km around Malaga. Notes on accommodation: The flat is very suitable for children, for the children younger than 12 yeards you don't need to pay. The flat is equipped with electric heating with air contioning with control 1 €/ 3 hours. Outside: The patio is private with many flower, a table and chairs. Cozy place for to drink something after a long day to enjoy Malaga City. Cleaning / Towels / Linen / Maid service: The towels and linens are included and are changed after every visit. We have stayed in El Carmen Flat twice and can warmly recommend it. It is conveniently furnished for two persons and can also accept a sudden guest in the livingroom. Kichen, shower/tub and heating are standard, although you must pay separately for energy you use. Its greatest asset, though, is its location. The flat is situated just around the corner from the end station of the Malaga Airport train. The shopping area, beach and the Old City are only a few minutes' walk away, each to a different direction. We look very much forward to our next trip to Malaga, due next year. An easy 10 minute stroll will get you the beautiful long beach of Malaga. There is a walking path or board walk that stretches the length of the beach and takes two hours to complete if walking. The beach also has many showers and lounge chairs. The trip from the flat to the Malaga airport is 15 minutes by car, and 30 minutes by bus. Booking Notes: 30% deposit required to reserve booking at a minimum of 100 Euros. Please feel free to email with any questions or concerns. Changeover Day: The flat may be rented any day of the week. Notes on prices: The price is for 2 people, the extra person is 10/euros/night. The children younger than 12 yeards old are free. The price in the summer or holiday terms is including 4 people.